Despite the recent market correction, bulls remain hopeful that stocks can avoid only their second negative calendar year since the bull run began in 2009. The optimist case is that the market is overreacting to the myriad challenges domestically and abroad. 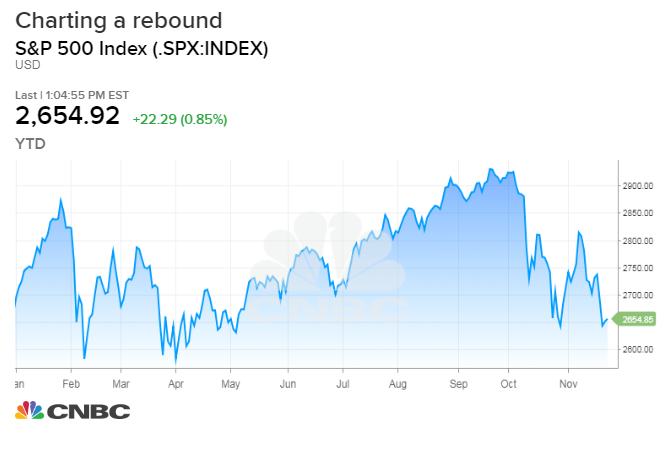 Jeff Saut, the veteran chief investment strategist at Raymond James, sees reason for optimism in a technical chart formation. A man has his photo taken hanging from a bull sculpture outside Las Ventas bullring during San Isidro's bullfighting fair in Madrid, Spain. Stocks are heading into the 2018 close with the very real threat of ending in negative territory, but market bulls still haven't given up hope. To the contrary, investors continue to shovel money into U.S. equities, despite high-profile warnings that a run that began in March 2009 has seen its better days. Sentiment remains reasonably high that the market can surmount an ever-increasing array of challenges that threatens the longest bull run in history. "After a record-setting nine-and-a-half year run, some fear that marks the end of the economy's expansion and the US stock market's epic rally. We don't think that's the case," John Stoltzfus, chief investment strategist at Oppenheimer Asset Management, said in a note. If the bears prevail, it will mark just the second time since the rally began that the S&P 500 finishes a calendar year in negative territory. Only 2015 has that distinction, and the decline that year was just 0.73 percent. The broad large-cap index was clinging to a 1 percent gain heading into Monday's trading, which saw a strong rally of about 1 percent. There is no shortage of challenges ahead. Paramount among them are threats from an escalating trade war between the U.S. and China. Concerns about economic weakness also are prevalent, as are worries that the Federal Reserve will continue increasing interest rates in an effort to stave off an inflation threat that does not seem particularly worrisome at present. On top of that, markets are concerned that a sloppy Brexit resolution will further threaten a fragile European economy and that fiscal problems in Italy could cause contagion. "While these are valid concerns, we believe some of the policy and political risks may be alleviated in coming weeks and growth could ultimately also hold up better than recent markets developments may suggest," Barclays economists Michael Gapen and Christian Keller wrote. "In the US, while the effects of the economic stimulus have likely peaked, momentum in public and private spending remains solid." The S&P 500 briefly entered correction mode during an aggressive Thanksgiving week sell-off. While Monday's rally took the market out of the 10 percent decline that defines a correction, the month is still shaping up as the worst November since 2008. Still, Jeff Saut, the veteran chief investment strategist at Raymond James, sees reason for optimism in a technical chart formation. If the S&P 500 should hit 2,600, that would make a double-bottom "which should act as a springboard for the year-end rally," he said. "It is stunning to us at this stage of a secular bull market, and a very bullish chart pattern, that so many pundits are scared to death!" Saut wrote. "We have long targeted mid-November as a turning point for the various markets for a variety of reasons." Indeed, a primary focal point of the bull case is that the market has simply gone overboard in its worries at a time when growth, even if slowing, remains robust. Corporate earnings, for example, are expected to slow from the blistering 2018 growth pace of 20.4 percent, but are still projected at 8.8 percent for 2019, according to FactSet. GDP growth, meanwhile, likely will recede from its 3 percent pace this year, but most economists are still looking at gains in the mid-2 percent range for the year ahead. Slumping energy prices also are providing tailwind for consumers, and even the trade skirmish is providing some hopes: Oppenheimer's Stoltzfus figures that the two sides eventually will cave as the economic toll mounts. "The longer the trade war between the US and China goes forward the less practical it is likely to seem for both sides to continue it," he said. "History has in our opinion proven that trade wars hurt all sides and curb the economic growth of all combatants." For now, Oppenheimer has an overweight position in information technology, the sector that helped elevate the market an, along with energy, most responsible for its latest tumble. However, the firm has a "slight underweight" on the recently spun-off communications services sector that contains some of tech's biggest names such as Netflix, Facebook and Google parent Alphabet. Where the larger market goes, though, remains a tough question. CNBC's Jim Cramer said Monday's snapback was more characteristic of a bear market rally off no real news catalyst. But the bulls remain, contributing $172 billion in new money to U.S. equity-based ETFs for the 12-month period through October, according to Morningstar. David Bianco, head of U.S. equities and chief investment officer at DWS, said he likes the current conditions, particularly an economy that "is neither too hot or too cold." "Major corrections are caused by a significant macroeconomic shock, by major revisions of earnings forecasts or large jumps in interest rates," he said. "I don't expect all that."